On top of the approximately 3 km thick ice sheet in Greenland the temperature is normally around minus 10-15 degrees C in the summer and about minus 60 degrees in the winter. This year, researchers from the Niels Bohr Institute observed temperatures above zero and a significant warming and melting of the upper 1½ meter layer of snow at the NEEM ice core drilling project in northwestern Greenland. The NEEM ice core drilling project’s camp is located approximately 500 km east of Thule and the researchers are very dependent on the weather – in part because transport in and out of the camp happens with Hercules planes that are equipped with special skis so it can land on the ice. It is difficult for the planes to land and take off again if the ice is too warm and sticks to the skis. They also can’t fly in bad weather with snowstorms. So the researchers have a weather station and are very adept at predicting the weather. “We could already see that the warm weather was coming four days before it arrived – and we could hardly believe it! – more than one degree above zero. That has never happened before,” says Paul Vallelonga, ice core researcher at the Centre for Ice and Climate at the Niels Bohr Institute at the University of Copenhagen. But the heat arrived as predicted and from the 11th to the 15th of July the air was up to 1½ degrees C and the snow reached melting point – but not just on the surface. As part of the research on the current climate they regularly dig a deep hole 1-2 meters deep. A two-meter hole provides information for three years of precipitation. 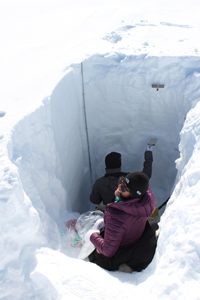 Samples of snow are taken from the top to the bottom of the walls of the hole to measure the levels of impurities and dust that blow in across the ice sheet. But you can also follow the build-up of heat. “The day after the warming began, the upper 12 cm of snow was close to the melting point and after only two days’ warming the upper 70 cm were above freezing. Small droplets of water were formed which trickled down in the ice to the colder layers where they froze into ice and formed a 5 cm thick layer of ice,” explains Paul Vallelonga. On top of everything else, it was raining, which further contributed to the warming of the snow. On the 15th of July they recorded the warming of the snow and the seeping of the meltwater to a depth of 1.5 meters. top 1.5 meters were above freezing. formed a thick layer of ice. 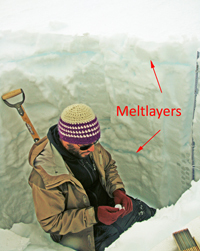 Previous research had recorded melt layers from the years 1946 and 1889. So warming has previously happened in history. 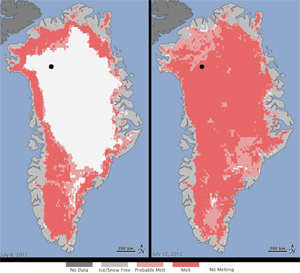 But in the last 20 years the temperature in Greenland has risen 1-2. Satellite observations of the ice sheet shows that the ice sheet has shrunk at the coasts, where it partly breaks off as icebergs and partly melts and flows out to sea. This means that the oceans will rise in the future. “Our calculations show that global sea levels will rise by 0.9-1.6 meters by the year 2100,” says Dorthe Dahl-Jensen, Professor and leader of Centre for Ice and Climate at the Niels Bohr Institute at the University of Copenhagen. But it is not solely due to the melting of the Greenland ice sheet. She explains that 45% of the rise in sea levels will come from small glaciers around the world, 45% will come from the big ice sheets, while 10 % is due to the warming and expansion of the seawater.